JM patients come in all ages and sizes, but almost all of them want to help to find a cure. Many of these activities offer plenty of opportunities for your child to help make a difference. And remember... Cure JM is ready to help! We have a team of fundraising coaches standing by to help you plan your fundraiser. Your Fundraising Coach help you get started, answer questions, motivate and inspire you. Contact or (760) 487-1079. 1) Friends and Family Letter or Email: This is the single most effective fundraising piece and one of the simplest. Cure JM can help you prepare an appropriate letter for your friends and family, explaining JM and the need for research. These campaigns can be done at any time of year but are especially useful during the holidays and for birthdays to request a donation in honor of a child battling JM. 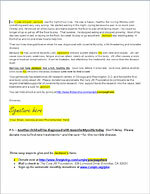 Click here to download a sample letter in Word format. 2) Online Fundraising Page: Have fun while raising money with CrowdRise.com. How does it work? Click here and in just a couple minutes you will have your own Cure JM fundraising page. Then send an email and let people know that you are raising money for Cure JM and sit back and watch the donations come in – you will be able to instantly see each donation made. It is that easy! Other families are having fun raising money in honor of birthdays, weddings, a new diagnosis, endurance event, anniversary of diagnosis or remission, or anything at all. Visit www.crowdrise.com/curejmfoundation or email to get started today! 3) Coin Collection Jar: Leave a jar by the door to drop spare change into. You’ll be surprised how fast this change adds up to a big donation to Cure JM! 4) Give-it-Up: Everyone in the family gives up something such as coffee, candy, ice cream, etc. The money they would have spent on these items goes into the Give-it-Up jar. 5) Stay-in-Night: Instead of going out to dinner and a movie, stay home and donate the money you would’ve spent to Cure JM. 6) Birthday Wishes for a Cure: Request donations to Cure JM in lieu of birthday gifts. This works for holiday gifts and wedding gifts as well. 7) Read-a-thon: Elementary school student and JM patient Austin raised over $800.00 for Cure JM when he implemented his very own fundraising idea, "Read for a Cure with Cure JM". We have taken Austin’s concept and further developed it so a single child or an entire school can use it. The forms are easy to use and everything is explained for the donor. It is as easy as gathering pledges for each minute (or each book) a child reads. 8) Jog-a-thon: This is ideal for schools that wish to raise money for Cure JM. Students collect pledges from friends and family based on how many laps they might run…or flat donations can be collected prior to the race. Cure JM families have raised over $50,000 through jog-a-thons! 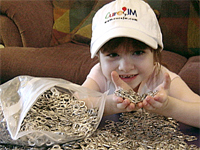 9) Change A Life Campaign: Ask your family, friends and your child's school to collect their spare change for one week in honor of your child, to benefit Cure JM Foundation and JM research. One school collected $4,000 in PENNIES! 10) Restaurant Nights: Many restaurants will donate a percentage of sales to Cure JM on a predetermined date. Create a flyer and distribute to your fellow students and enjoy a fun evening that benefits Cure JM. Click here to get started with a Chuck E. Cheese fundraiser. 11) Special Dress Days: Choose from Crazy Dress Day, Backwards Dress Day, Wacky Hat Day, etc. Students donate from $1.00-$5.00 to dress the part. 13) Paper Airplane Contest: Students donate $1.00-$5.00 for a chance to create and throw a paper airplane into a basket or goal. Ask local vendors to donate prizes for the winners. A Cure JM family raised over $200 with this event. 14) School dance or dance-a-thon: Students purchase tickets to attend dance party…proceeds go to Cure JM. Alternatively, you could hold a dance-a-thon where students ask their friends and family to donate based on how many dances, or how many minutes they can dance. 15) Jump rope-a-thon: This is good for the younger kids. The students ask friends and family for donations based on how many minutes they can jump-rope. Hula hoops are another possibility. 16) Art Sale: Have the students make their own artwork and “sell” it to the parents or grandparents. 17) Concession Stands: Hold these at school events to benefit Cure JM. 18) Rock/Paper/Scissors Contest: Charge entry fee and use brackets like in basketball. 19) Casual for a Cure: Employees pay $5.00-$10.00 to dress in casual clothes. 20) Dinner parties: Hold a company party on-site or at someone’s home. Ask for a $25 donation to attend. 21) Cocktails for a Cure: Hold a cocktail party at a restaurant or home and either require a flat donation or a donation per drink. 22) United Way Donations: Ask fellow employees to donate to Cure JM through United Way. 23) Walk-a-thon or Bike-a-thon: Ask your friends to participate in one of these events, and collect donations beforehand from friends and family. Donations can be flat or based on length of time, miles covered, etc. 24) Bowl-a-thon: Find a local bowling alley to sponsor the event; and invite friends and family to bowl in exchange for a donation to Cure JM. Gilson Lee and his family raised over $5,000 with a bowl-a-thon! 25) Cash for Trash: Line up all your family, co-workers, schools and organizations. Have them save the soft drink can tabs or even better, the whole can! Save them up and then turn them in for valuable research dollars. Have the reclamation center make the check out to Cure JM Foundation and send it to us with a note that it is from your recycling efforts. 26) Car Wash: Get your friends together and wash cars in exchange for donations to Cure JM. 27) Just for Fun Team Games: Get your friends and neighborhood involved in various team games, such as baseball, kickball or volleyball. Participants make a donation to Cure JM to play. 28) Golf Fore a Cure: Hold a golf tournament to benefit Cure JM. Three Cure JM families hold these on an annual basis and have raised a significant amount of money! 29) Kicks for a Cure: Hold a Field Goal contest or a Karate Kick Contest: Ask for donations to enter the contest. Winner receives prizes donated from local vendors. 30) Homerun Derby: Hold a homerun contest or even a Free Throw contest. 31) Neighborhood Yard Sale: Ask your neighbors to join in for a neighborhood yard sale and donate all of the proceeds to Cure JM. Get a realtor involved to sponsor the event, run an ad in the paper and create maps/flyers. 32) Poker Party: Invite your friends over for a fun night of poker in exchange for a donation to Cure JM. 33) Dog Wash: This is a great one for kids. Offer to wash the dogs in your neighborhood for a $5.00-$10.00 donation. 34) Lemon-aid Stand or Sno-Cone Stand: Set these up with a few friends on a warm summer day. 36) Bakeless Sale: Here's a 21st Century take on an old classic. Friends, relatives and co-workers, are invited to NOT spend hours baking a cake, pie or cookies and to NOT stand in the sun all day trying to sell those baked goods. Instead, ask that they take the money they would have spent baking or buying those treats and donate it directly to Cure JM Foundation. Click here to print a poem that you can give to family and friends to start your own bakeless bake sale. 37) Creations for a Cure: Have kids make bracelets, necklaces, etc. and ask for donations for their masterpieces. 38) Theatre Benefits: Ask a local theatre to hold a benefit performance for Cure JM. 39) Concert for a Cure: Find a band who will hold a benefit concert for Cure JM. 40) Picture a Cure: Find a professional photographer who will donate his/her time to take holiday pictures for families and donate the proceeds to Cure JM. 41) Product Promotions: Find friends who hold in-home sales parties for companies such as Mary Kay Cosmetics; and ask them to sponsor a sales night to benefit Cure JM. 42) Cuts for a Cure: Ask a local hair salon to give a portion of their proceeds to Cure JM for a predetermined date. Bring in a well-known hair stylist if possible. 43) Carnival for a Cure: Hold a carnival with jump tents, food and games. Find local vendors to sell food items and donate prizes. 44) Cure JM Literature: Cure JM Foundation has brochures, posters, and flyers available for your fundraising and awareness efforts in the Literature section of this website. You can download and print these items for distribution to family and friends (and strangers!) Please take these to your pediatrician, rheumatologist, dermatologist, etc. and ask them to display them in their offices or waiting room so that other JM families can find their way to us. 45) Kids’ Camp: Kids run a neighborhood day camp for 2 hours with arts and crafts. Fees benefit Cure JM. 46) Family Websites: Add a link to the Cure JM donation page from your family website. 47) Shop Online to Benefit Cure JM: Do all of your shopping at major retailers through iGive, Goodshop or Amazon Smile. Or shop at the Cure JM Store. Visit www.curejm.org/shop for all of the details! 48) I Search: Search the Web with http://isearch.igive.com/toolbar.cfm. After you sign up, one cent is donated to Cure JM for each search. 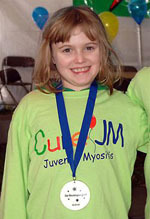 If every Cure JM family searched the Web just 10 times a day through this tool, Cure JM would receive $22,000 in a year! 49) E-Bay: Sell unwanted items on E-Bay and donate the proceeds to Cure JM. 50) Facebook Pages: Provide a link to Cure JM donation page from your personal page. Also, add Cure JM to your “Causes”, as Cure JM is registered with both sites as an official cause. Ask others to join your cause and add Cure JM to their page. 51) Twitter: Include Cure JM when you use this site. 54) Jar Wars: Each classroom at school competes to collect change. It is a very easy, competitive and fun fundraiser! Click here for a zip file with everything you need to get started today!